As I needed battery jump cables, I began my search to find the best one. Looking up many stores and I found 2 qualities of battery jump cables; One is for RS 600 and the other for RS 1200. The one in lower price range had a very thin wire which couldn’t live up long as the wires were very thin, it felt like disposable cable after a few times. The expensive one’s quality was fine, a lot better then the cheap one but to me these were not worth RS 1200. So I decided that why not build one myself, and so I did. Used some thick cable, went to junkyard to get the wire and quite surprisingly I found Hitachi Heavy Duty Wire which can pass high voltage as its rated for 1100V max. Pretty good for a battery jump cable. High tension wires and length according to your need, 15 ft. is enough, I however bought 7.5 ft. 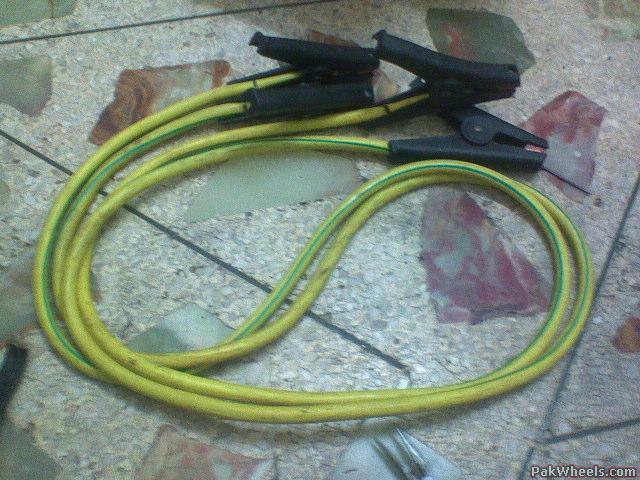 Cost incurred: RS 650 – Wire 15ft + RS 120 Clips, RS 770 in total. And some tools to help you put it up together with some skills. Overall result is a lot more satisfactory then what those RS 1200 wires offered me as these wires are much more heavier then those. I have got different type of Crocodile clips as they are fully plastic and just have a center piece made up of copper. The good thing about these clips are that a short circuit cannot occur as it does in the clips made of up steel completely. Its Desi Jugar, using different tools to open up the clip and punch the wire inside and damn it was tough, the clip even snapped with force on my thumb, the pain felt long after. Finally success, after so much hassles.Punching wire inside the clip was painful.